The India of mythology, the one of poverty, of sacredness and spirituality, of the diaspora, of adoring love stories, of ethereal and motherly women and superheroes on the one hand, and on the other hand, the multiple languages and cinematographies, the political mêlée and the hidden Indias, these are the faces of the same complex and global India which are intended to be sketched in this work. Indian cinema has a long history that dates back to the origins of cinema when the Lumière brothers went to India and astounded their audience. Since then an illusion-starved audience has not stopped being fascinated and entertained by the magic of moving images. India took its first steps into the world of cinema when Phalke gave life to mythological characters on the screen and produced (inter)national masterpieces. Different film industries began to bloom in India and they embarked on the process of producing and representing ‘realities’ in their own unique way. This differentiation is the strength of the development of the restless cinematographic industries in this country. During the two World Wars, when Indian soldiers were fighting alongside European armies, India was producing films on mythology: a gesture that on the one hand seemed to ward off bad luck with the invocation of Gods and Goddesses, and on the other, gave fame to the first big movie stars and film form to the secular Epics of India. It is in 1947 that events began to change drastically. Lord Mountbatten was the last viceroy and British Governor General of India before the transfer of power became effective in August 1947. There were riots after the partition, in which 200,000 people died, and over 10 million Hindus, Sikhs and Muslims were redistributed, with much suffering, within the new geographic confines. The traumatic experience of partition affected the lives and beliefs of millions of the now Pakistanis and Indians, as well as the national and political stability of the countries, and it put a full stop to the exotic world and fervent imagination that populated the silver screens of India and Pakistan pre-partition. The optimism expected due to the freedom from an oppressive and long British colonization was not enough to free filmic texts from images of pain, loss and misfortune. A few titles such as Mela/Mela (SU Sunny, 1948), Deedar/Meeting (Nitin Bose, 1951) and Jugnu/ Firefly (Shaukat Hussain Rizvi, 1947) perfectly encapsulated the mood of this era. The historical dramatic circumstances echoed in the background and the films portrayed tragic stories of heroes in post-independent India who, in and out of jail, failed not only to gain their love interest but also managed to tarnish their dignity within society’s rigid rules. Following the dark moment of the partition, Hindi cinema entered a new season. It is May 1952 when Nehru forms a post-independence government as a consequence of the general election. At the same time, the troubles of the hero in De Sica’s Ladri di Biciclette/ Bicycle Thieves (1948) had a remarkable impact on the cinema of India. 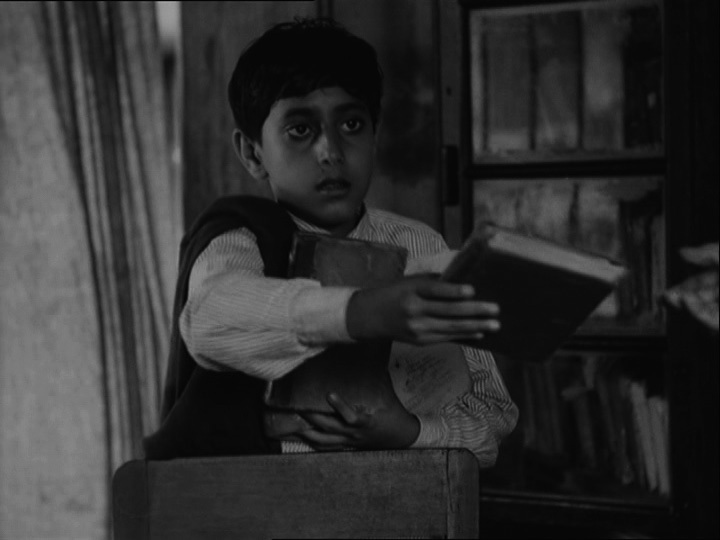 The aesthetic,dramatic premises and the vicissitudes of the protagonist in the film Bicycle Thieves strongly influenced the poetry of Raj Kapoor’s Awaara/Vagabond (1951), both ultimate survivors of dreadful conflicts. The 1950s are not only the years that confirm the success of male actors such as Raj Kapoor and Guru Dutt but also of heroines. Besides Nargis’s moving representation of Radha in Bharat Mata/Mother India (Mehboob Khan, 1957) two other beautiful and yet prematurely departed heroines are to be mentioned. The film screens in India are crossed by Meena Kumari’s unforgettable Gauri in Baiju Bawra/Baiju the Poet (Vijay Bhatt, 1952) and by fledgling starlet Madhubala, later called Venus of the Indian Screen, who is worshipped as a lasting legend of Indian cinema with films such as Mahal/The Palace (Kamal Amrohi, 1949), Mr and Mrs ’55 (Guru Dutt, 1955) and The Greatest of the Mughals/Mughal-e-Azam (K Asif, 1960). In the 1960s, India began to regard Nehru’s socialism with scepticism; in chorus, the upper-class romantic hero, Shammi Kapoor, rode the cinematographic screens. At the end of the 1960s, with the dominant arrival of the Indian left-wing party on the political scene, the urban middle class joined the class struggle, giving voice to the middle-class idealistic and romantic heroes interpreted by Rajesh Khanna. The end of the 1960s was a period of protests by peasants, workers and students all over the world. It is in this political and cultural climate that the cinema in India became exponentially strident and spoke out about corruption as well as the inability of the state to appease and endorse the victimized working-class hero who challenged the status quo. From 1975 to 1977 the prime minister, Indira Gandhi, declared a state of emergency and suspended many civil liberties; in the films Deewar/The Wall (Yash Chopra, 1975) and Sholay/Embers (Ramesh Sippy, 1975), Amitabh Bachchan became the emblem and the embodiment of the ‘angry young man’. In the 1980s, the political climate in India began to change, Rajiv Gandhi began opening up India to global economic expansion, and films began changing as well. The portrait of the hero’s romantic love interest was radically truncated in the 1950s and the 1960s, whereas from the late 1980s, the role of romantic hero began to be central to the story. In the early 1990s, while India tried to join the global economy at full steam, the content and the attitude of the cinema industry began to go global. Dilwale Dulhania Le Jayenge/The Big-Hearted Will Win the Bride (Aditya Chopra, 1995) was a landmark and Shahrukh Khan and Kajol were established as Bollywood superstars. An urban and cosmopolitan Indian hero replaced the macho hero. Alongside the romantic films about the changes in patriarchal Indian family and the domestic sphere as glossy portrayals of urban life, the actual off-screen contribution of ‘black money’ to the financing of the overall production of Bollywood films was audaciously represented on-screen in underworld and gangster films such as Ram Gopal Varma’s Satya (1998) and Company (2002). Tags: Bollywood, cinema, Directory, film, India. Bookmark the permalink.